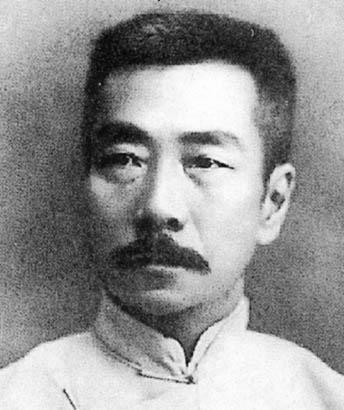 The modern Chinese author Lu Xun was a prominent libertarian who wrote in the early decades after the Chinese republican revolution of 1911. After the imperial government was toppled and the monarchy abolished in 1912, the despot Yuan Shikai, backed by the military, seized power over the fragile and embryonic Republic of China. He dissolved its ruling party, assassinated elected politicians, ignored the provisional republican constitution, and threw his dissenters into prison. In the subsequent decades, the libertarian and democratic principles of the republican revolution were abandoned, and China descended into a civil war between rival warlords and their armies. Where the old imperial order executed with decapitation, the revolutionaries, in their modernity, executed people with “death by firing squad” (Lovell, 123) instead. The modernisers and traditionalists were equally brutal, and indistinguishable from each other in substance. The optimism that sprang forth from the Revolution was soundly smothered. As the German enlightenment philosopher Immanuel Kant once observed, in the wake of revolution, “New prejudices will serve, in place of the old, as guide lines for the unthinking multitude” (Kant, “What is Enlightenment,” 59). Disillusioned by the new republic’s regression into tyranny, Lu Xun retreated into a shell of pessimistic despondence. He became a recluse. When asked by a friend to begin writing again, he initially declined, likening China to an inescapable iron house, “full of sound sleepers—all about to suffocate to death. Let them die in their sleep and they will feel nothing. Is it right to cry out?” (Lovell, 19) The language of humanism often possesses an optimistic conviction that freedom will eventually prevail. However, as the 1911 Revolution demonstrates, this project often fails, and the prospect of individual rights and freedoms recedes into the distance. Lu Xun was convinced, like Kant, that “political revolution could only change the external forms of government,” (Lin, 109) and a more fundamental, intellectual change in the nature of the Chinese people was necessary. But we may observe that “precisely because Lu Xun had specified the primary cause of China’s weakness in intellectual and moral terms, his findings led him to profound despair,” (Lin, 109) as he was surrounded by too much apparently irremediable intellectual and moral decrepitude. Informed by this pessimism, Lu Xun’s characters, whether loyalists to tradition or modern revolutionaries, whether from the educated elite or from the illiterate peasantry, all live despicable, empty lives. This essay elucidates from Lu Xun’s first collection of short stories a grim and different form of existentialism, one drenched in the bitterness of his historical circumstance and written in the pessimistic conviction that any movement for freedom will eventually miscarry. An individual ceases to be a self when he sees himself only as an actor performing for others outside of himself. When he lives as though his existence can only derive meaning from the hoots and jeers of an audience, he lives only as a spectacle, and possesses no internal life except as a being possessed by other people—by the Other—even when the Other is not even present. The portrait presented in Lu Xun’s “The Real Story of Ah Q” suggests such a thesis. 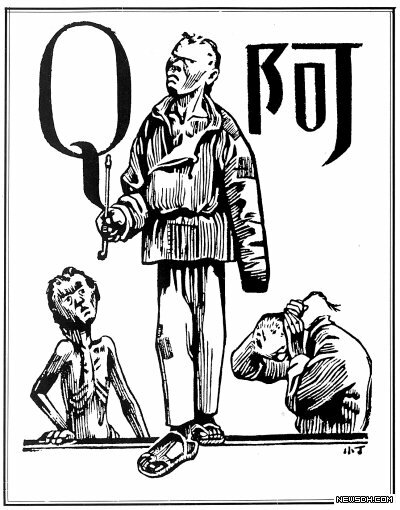 The narrator confesses that he does not know how to write the titular character Ah Q’s real name, and so substitutes it with the Latin letter ‘Q’. Ah Q is thereby relegated to namelessness, without identity or individual existence. The letter Q by itself, unlike Chinese characters, has no semantic content, and is hence devoid of meaning. Graphologically, it suggests a faceless head, with hair tied in the idiosyncratic queue of Qing China. By his namelessness, Ah Q becomes a generic representative of the everyman in China, and he proves to be a wretched representative indeed. After losing a fight, Ah Q “creates” his own victory by slapping his own face, “perfectly convinced that he had hit someone else entirely—even though his cheeks continue to sting” (Lovell 87-88). It is a private “victory,” with no other spectators, yet we cannot say that Ah Q thereby creates value for himself as an individual, for he has an imaginary opponent over whom he deludes himself into believing he has triumphed. Even when no audience is present, Ah Q demonstrates his need to make a spectacle of himself to a pretended audience, as he knows of no other mode of living. He exists only in the space of the Other, even an imagined Other. When signing the statement that condemns him to death, the illiterate Ah Q, who can not write his own name, “wanted to draw a perfect circle” (Lovell, 120) as a substitute. He “focused all his energies on the drawing of this circle. Afraid of looking ridiculous,” he forgets to be afraid of being executed, forgets to protest on his own behalf or defend himself. As he is led around the streets of his hometown toward the execution ground, an “ant-like audience” gathers around him. The phrase “ant-like” suggests a swarm insects scavenging for rubbish or leftover food. In the midst of the throng, Ah Q is “suddenly ashamed of his absence of spirit: of his failure to croak out a few lines of opera” (Lovell, 122). He thereby makes out his life, and death, to be only a spectacle for the audience of the “cheering crowd.” Ah Q tries and fails to conform to what the crowd expects, and what he assumes that they expect, and is too absorbed in his role to even feel any genuine degree of emotion at the imminent approach of his own death. 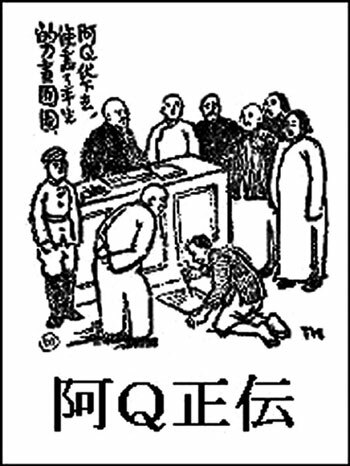 This scene from “Ah Q’s Real Story” echoes another execution scene, recounted in the preface of Lu Xun’s first volume of short stories. The scene was shown in a newsreel after a lecture at the Japanese university at which Lu Xun was studying for a medical degree. It depicted a mass of Chinese prisoners caught spying for the Russians in the Russo-Japanese War. Lu Xun despaired that, among the prisoners, “every face was utterly, stupidly blank” despite being “about to be beheaded […] as a public example to the appreciative mob” (Lovell, 17). It was an incident that convinced the younger Lu Xun to abandon his medical studies in favour of literature and the arts in an attempt to “change the spirit” of his countrymen, and help them cease being “gawping spectators” even of their own death and captivity. He was later disabused of his naïve hopes by subsequent historical events, but Lu Xun’s initial despair remained and continued to inform his portrayal of human wretchedness in his fiction. The sub-man may declare, “I endeavour to work for the freedom of others!” and still remain a sub-man. “Freedom” can likewise become only another word, another label, and Lu Xun saw this in the revolutionaries and their supporters. Ah Q is a quintessential sub-man who is “one day, a monarchist, the next day, an anarchist, he is more readily anti-semitic, anti-clerical, or anti-republican” (Kant, 60) and even, in Ah Q’s case, republican. When on a whim, Ah Q suddenly decides to be a revolutionary, he shouts “Rebel! Rebel!” (Lovell, 109) in the streets and sings nonsense songs of “Tum-ti-tum, clang clang-clang!” i.e. the sounds of a wordless, noisy gong and drum, without meaning. By placing Ah Q among the nominally libertarian revolutionaries, Lu Xun highlights the sub-man nature even of those who claim that they are fighting for the freedom of others. Ah Q dreams of his social superiors “kneeling before me, twittering with fear,” which reveals his violent, selfish motivations. When the revolutionaries storm a convent to smash a tablet dedicated to the Emperor, injuring the nuns in the process, they reveal their iconoclastic tendencies. People may execute a destructive project even in the name of freedom. Ah Q and the other characters of his story evaluate their self-worth through the respect they gain from the other townspeople. This derives from a traditional understanding of respect, one that relies on relative positions in a social hierarchy. But such respect is often fickle, and built on absurd and tenuous foundations. When Ah Q boasted in public that he was the father of the wealthy Mr. Zhao, he is promptly summoned and slapped by Mr. Zhao, whereupon “his fellow villagers did begin to treat him with a new respect,” (Lovell, 88) for the reason that the people took notice “when a man of reputation like Mr Zhao got involved” in slapping someone. Ah Q enjoyed an increase of respect from the villagers, and thereby an increase in his measure of self-worth, from that slap, “with the hittee sharing in the hitter’s glory.” That Ah Q is able to derive any degree of value from such an association exposes how other social associations, such as familial relationships, age, and other traditional sources of respect, are absurd as such measures reflect no part of the value and worth of a person. Ah Q reveals his dependence on these vapid externalities to affirm his identity and self-worth, but this condition does not afflict only people of a low social position like Ah Q. Even individuals who obtain a high social position through this network of absurdities are likewise wretched. One such character has passed the provincial-level examinations that gain him entry into the civil service and a higher social position, due to his fame, “for thirty miles around and about, everyone—and not just in Weizhuang—thought his full name was Mr Provincial Examination” (Lovell, 103). This prominent individual, despite his elite education and social worth, then suffers the same fate as the nameless Ah Q, and is known only by a name that is no less absurd and meaningless. Mr. Provincial Examination loses his identity, and his agency as a self, to the fact that he had passed the provincial-level examination. It consumes his entire being, and his life is no more authentic than Ah Q’s, despite its pomp and the villagers’ collective respect for his high status. The freedom of the child remains sincere and full of wonder even in a social reality where every adult is expected to conform his actions, beliefs and even language to a pre-determined mould. In “My Old Home,” Lu Xun subverts Simone de Beauvoir’s notion of freedom as the province of adulthood and adult choices. Contrary to de Beauvoir’s suggestion that the child’s “acts engage nothing, not even himself” (de Beauvoir, 37), the child is free for the very reason that he is “in a state of security by the virtue of his very insignificance.” The narrator of “My Old Home” recounts meeting his childhood friend Runtu again after thirty years had passed. As children, although Runtu belonged to a farmer’s family and the narrator belonged to a family of educated literati, the farmer’s sphere and the narrator’s are not distinguished in a hierarchy, as they would later become in their adulthood. The child narrator is in awe of Runtu’s ability to “trap small birds” and wants Runtu to teach him the skill, adopting the position of a student even though he himself is more educated. Listening to Runtu and learning from him, the narrator confesses that “I still had so much to discover: seashells of every colour, dangerous goings-on around watermelons […] While Runtu was at his seashore, it seemed, we had all been imprisoned within the high walls of our courtyard mansions, staring up at the sky” (Lovell, 73). It is a confession of a genuine sense of wonder, of a genuine seeking out of another individual’s sphere and recognising its worth as coequal to his own. The image of “staring up at the sky” alludes to a common Chinese idiom of the frog at the bottom of the well, who looks up at his single patch of sky and thinks it to be the totality of the heavens, who in the inescapable isolation of his well imagines his confinements to be the totality of the whole world, and he the world’s sole inhabitant. By this wonder, the narrator escapes the walls of the well and the alienation that separates the Otherness of Runtu and the different life he inhabits from himself: then we may say that this child does indeed engage with himself and with the Other, and more sincerely than the adult Runtu and narrator do. The children in their first encounter meet without the burden of traditionally imposed social roles, and the relation they adopt between each other “has to be made” (de Beauvoir, 37) by themselves, for themselves. It is the adult Runtu and narrator who inhabit a world that is, to use de Beauvoir’s term, “ready-made.” At their reunion, the narrator greets Runtu as “闰土哥” (Zhang, 50) or “big brother Runtu” in an effort to erase the social hierarchy that has crystallised around them as they have grown up. But the narrator’s gesture still navigates only within the space of traditional relationships, specifically that between the younger and older brother, and is unable to transcend it. Runtu refuses to play along and refers to the narrator with the honorific “老爺” (literally “old grandfather”) and urges his young son to kowtow to the narrator. The genuineness and frankness of the young Runtu have evaporated; and we cannot imagine Runtu as an adult teaching the narrator how to trap birds, or recounting his life on the farm in the same sincere tones. Runtu and the narrator have fossilized into their roles, and can no longer genuinely relate to each other as real friends as they did in childhood. In this sense, to paraphrase de Beauvoir’s own paraphrase of Descartes, Man’s unhappiness is due to his having later to be an adult, to have the inescapable burden of his social role imposed upon his existence. Heidegger’s “What is metaphysics?” describes anxiety as analogous to a feeling of fear, but whereas fear is always “fear of something in particular,” anxiety “is always anxiety for . . . , but not for this or that” (Heidegger, 102-103). Hovering in that anxiety, the world slips away, and all the associations that gave the things around us meaning—and that gave us meaning—recede. Then, we are revealed to be floating in the nothing, free of the associations, attitudes and roles we play in the world. In a parallel to the anxiety described by Heidegger, the narrator is seized by a vague, convicting sense of hope “in the face of nothing in particular,” save a retreating back that paradoxically looms larger, which “shames” him while bolstering his “courage and hope” (Lovell, 55). Unsure of how to confront such a vague and uneasy sense of shame and hope, the narrator gives a fistful of coins to a police officer, asking him to make sure the rickshaw-puller receives it. He does not himself ensure that the money goes to the rickshaw-puller; it is evidently an action made in confusion. The narrator is troubled by the question of “what had I meant by that handful of coins? Was it a reward? Did I have the right to pass judgement? I could not answer my own questions” (Lovell, 54) because the questions were borne from an uneasiness and hope whose meaning is difficult to firmly grasp, but which have nonetheless shaken the foundations of his prevailing sense of pessimism. In that moment, the narrator has been stripped bare of his cynicism. The rickshaw puller’s actions were wholly apolitical, wholly human; he is able to take himself “out of commission” as a rickshaw-puller in the moment he sees a greater need, and acts accordingly. The contrast between the attitude of the rickshaw puller and the narrator’s own attitude extracts him, for the brief duration of this minor incident, out of the pessimism in which he has bound himself. That he was pulled out of a trough of despair into the nothing made this experience of anxiety seem more like an oppressive, heavy sense of hope than like fear, to which Heidegger had compared it. Having lived through the failures of revolution, Lu Xun in his despair tried to strangle his sense of hope. In “My Old Home”, the narrator “secretly smiled at [Runtu’s] worship of idols” when he saw him take a ceremonial incense-burner. But then he later compares his “own weakness of hope” to this idol-worship, bitterly dismissing hope as “an idol of my own making.” The prospect of the freedom in China being realised is like the gods he does not believe in: non-existent, and any prayer and sacrifice directed to them futile. “His wishes were immediately material, while mine were distantly vague; that was the only difference between us.” Worse than a god, to whom we may make specific petitions and worship in a pre-ordained manner, the idol of freedom necessarily offers no such directness. Pessimism comes easily when we found our hopes on something as slippery and ambiguous as freedom. Despite this, Lu Xun concludes his story with the observation that “Hope is not something for which we can say exists or does not exist. It is like a path on the earth: the earth had no path in the first place, it emerges only after many people walk the way” (Zhang, 53). Steeped in the despair of the aftermath of the freedom’s failures after the 1911 revolution, he still concedes that “however hard I tried, I couldn’t obliterate my own sense of hope” (Lovell, 17). The metaphor of the emergent path, of a tabula rasa earth on which we have to ourselves inscribe in order to create our own meaning, parallels the existentialist idea of abandonment. The existentialists understand human existence as one “cast into the world” (Sartre, 29) and abandoned by the idea of God, such that we no longer have any source other than ourselves to rely on to create our own meaning, or justify our existence. Jean-Paul Sartre explains that, if God does not exist, “we have neither behind us, nor before us, in the luminous realm of values, any means of justification or excuse” (Sartre, 29). However, as someone raised with a Chinese worldview, Lu Xun inhabited a culture that never had an omnipresent Abrahamic God that could serve as a source of transcendental value. For him, there was no absence, no need to “eliminate God as painlessly as possible” (Sartre, 26) in the first place, and there was never a need for an “infinite and perfect consciousness” to validate the standard of human goodness. That humanity needs to be the author of its own hope and its own future is taken as a fact as natural as the pathless earth. Without subtracting from the significance of each individual’s passage, the emergent path is a humanistic image that suggests the importance of being part of a larger community or movement of people, of fellow travellers, walking the same path together. To this end, we may explain Lu Xun’s pessimism as a form of loneliness, abandoned not by God, but by all his countrymen in their project of freedom. It is a project that, arguably, even in the present day has not remotely come to full fruition. We glean from Lu Xun’s work perspectives that are sympathetic to that of the existentialists whose work came, chronologically, after his. But this perspective is ultimately a product of the historical circumstances in which Lu Xun wrote, and from it we obtain a philosophy that is humanistic even as it presumes the worst of humanity. It stands in contrast to its existentialist kin on many points, because it was written by an individual made conscious of different realities from a different continent, in a different historical period. de Beauvoir, Simone, and Bernard Frechtman. 1949; 1948. The ethics of ambiguity. New York: Philosophical Library. Heidegger, Martin. “What is Metaphysics?” from Basic Writings: From Being and Time (1927) to The Task of Thinking (1964). and expanded ed. San Francisco: HarperSanFrancisco, 1993. Lin Yu-Sheng. “The Morality of Mind and Immorality of Politics: Reflections on Lu Xun, the Intellectual” in Lu Xun and his legacy edited by Lee, Leo Ou-fan. 1985. Berkeley: University of California Press. Lu Xun, translated by Julia Lovell. 2009. The Real Story of Ah-Q and other tales of China: The complete fiction of Lu Xun. Penguin classics. New York: Penguin Books. Lu Xun, and Zhang Xiufeng [张秀枫]. 鲁迅小说全编. 第1版. Beijing: 北京工业大学出版社. Sartre, Jean-Paul and Carol Macomber. 2007. Existentialism is a Humanism; including, a commentary on the Stranger. New Haven: Yale University Press. Kant, Immanuel. “What is Enlightenment?” in What is Enlightenment? Eighteenth-century answers and twentieth-century questions edited by James Schmidt. 1996. Philosophical traditions. Vol. 7. Berkeley: University of California Press. All quotes of Lu Xun’s texts elsewhere in this essay are from Julia Lovell’s English translation of Lu Xun’s fiction, published by Penguin Books. This quote, however, is my own translation, since Lovell’s elegant rendering of the passage did not serve as a sufficiently literal translation.